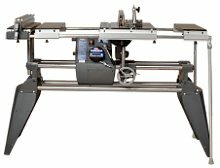 Shopsmith is ready to build you a new Mark 7 or Mark V, equipped with your choice of two different work table / extension table configurations to match the types of work you're planning to do. 90-Day Money-Back Guarantee - Try your new Shopsmith in your own home shop for a full 90 days. Use it to build any project - as many as you like. Then, if you don't agree that it's all we've said, simplify notify us and we'll tell you how to return your Mark 7 or Mark V.
Note: AK/HI - Please call Shopsmith Customer Service at 1-937-890-5197 for shipping cost information for Alaska and Hawaii. The Mark 7 PowerPro Model adds an electronically controlled DVR (Digital Variable Reluctance) motor and digital electronic speed control mechanism expanding the speed range to 250 - 10,000 rpm, increasing the power to 1-3/4 hp (2 hp at 240 volts), and adding forward/reverse operation. It also adds pivoting from either end, giving you both over and under table operation. Along with the five basic functions, you gain over-table routing and under-table shaping. The Mark V Model 520 with pro fence table system starts with the same components as the Model 510 system above and delivers the same 98" rip capacity. To this, it adds adjustable direct reading rip scales that indicate ripping widths at a glance; new, more rigid extruded aluminum work table and extension table rails with quick locking knobs; and a heavy-duty rip fence, featuring dual fast-acting locking levers and a T-Slot in each face, allowing the use of standard Shopsmith featherboards as hold-downs. The Mark V Model 510 comes equipped with one rigid mounted extension table, standard rip fence with a single T-slot on top, (2) floating extension tables, (4) connecting tubes and (2) telescoping legs This table system gives you ripping capacity of a full 98". 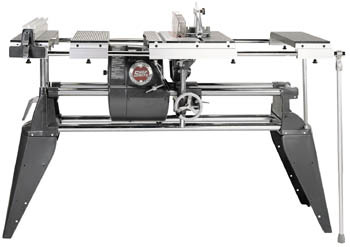 Five functions (table saw, drill press, lathe, horizontal boring machine and disc sander) in one machine.